SCHAUMBURG, Ill. – Dec. 12, 2011 – Motorola Solutions, Inc. (NYSE: MSI), a leading provider of mission-critical communication solutions and services for enterprise and government customers, today introduced the MC2100 industrial mobile computing series, addressing the need for a smaller, rugged mobile computer that expands the range of solutions available for both large enterprises and small- and medium-sized businesses. • Motorola redefines the value tier for rugged mobile computers with five configurations of the MC2100 that include three different scan engines, options for batch and WLAN connectivity, and vertical-specific accessories. • The lightweight and ergonomic MC2100 is ideal for inventory management, stock replenishment, price marking, and shelf labeling. • The MC2100 will be the first value-tier rugged handheld in the mobile computing industry to support HTML5 via Motorola’s RhoElements application enablement framework. 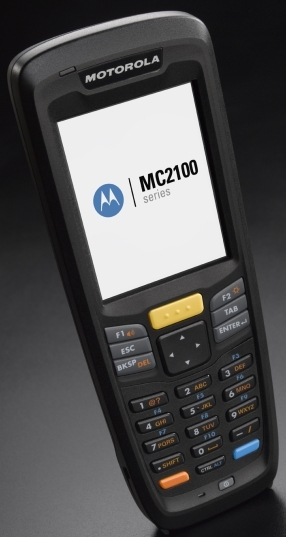 • The MC2100 mobile computing series leverages the same hardware platform as other Motorola mobile computing products to help simplify application support and integration into an enterprise environment. • Motorola’s MC2100 mobile computer will be available with the Service from the Start with Comprehensive Coverage program, providing coverage for normal wear and tear as well as accidental damage to internal and external components, significantly reducing unforeseen repair expenses. • Motorola’s MC2100 mobile computing series is expected to ship in the first quarter of 2012.